Mitsubishi Motors Philippines Corporation (MMPC) today announced that it has, for the first time, begun the mass production of the Mitsubishi Mirage hatchback model in its Santa Rosa plant. 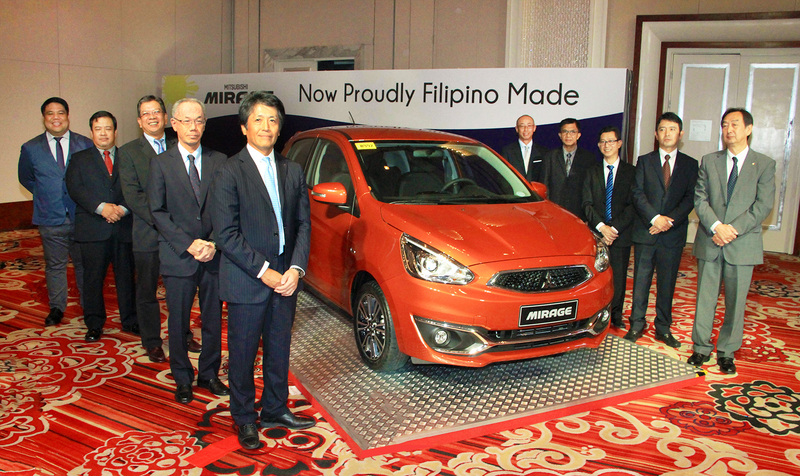 The first Mitsubishi Mirage hatchback off the assembly line was presented today in a ceremony held at the Solaire Resort and Casino in Parañaque City. MMPC has previously imported the Mirage hatchback from Thailand. But following a ₱ 4.3 Billion investment by MMPC in its production facilities, the company is now able to produce the Mirage locally. Last February, MMPC presented the first Mirage G4 sedan manufactured in the Philippines to President Rodrigo Duterte. Both the Mirage G4 sedan and hatchback are Mitsubishi Motors’ entry into the government’s Comprehensive Automotive Resurgence Strategy (CARS) program. The CARS program aims to position the Philippines as Southeast Asia’s car assembly hub, through attracting new investment into the sector and generating increased consumer demand within the Philippines. Mitsubishi Motors Philippines has engaged in locally manufacturing of vehicles for more than 50 years now. It is the number two auto company in the country, with a market share of 16 per cent, thanks to a strong network of local commercial partners. The transfer of Mirage production to the Philippines will lead to new jobs within MMPC, and will also benefit the 31 local businesses which were awarded to supply a total of 255 parts for the car. MMPC is now actively working on its parts localization activities to further increase the local content ratio. “MMPC will continue to exert great efforts to make a contribution to Philippine society and the economy to support the government in its effort to promote the entire automotive industry” said MMPC incoming President and Chief Executive Officer Mr. Mutsuhiro Oshikiri.